RealWorld Icon Editor and other applications based on the RealWorld Designer framework make use of 3D graphics. 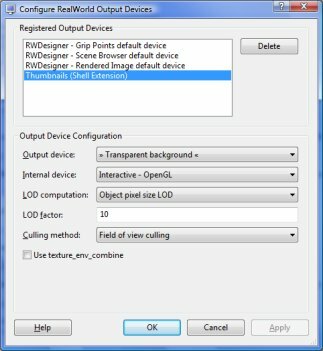 A rendering device plug-in is used to transform a 3D scene to a 2D image shown on the display. Each use case requires a differently configured device. The requirements are different for interactive 3D modeling, thumbnail generation or transformation to image. The Manage Output Devices dialog serves as a central point for configuration and management of different rendering devices. The dialog can be accessed using the Tools->Manage output devices menu command and may also be available in Control Panel. The upper part of the dialog lists names of known device configurations. Each item describes a situation, in which is the device used. Device configurations will appear in the list only after they are first used in that scenario. For example the Thumbnails (Shell Extension) device will appear only if RealWorld Thumbnails is installed and it was used to generate at least 1 thumbnail from a 3D model. The lower part shows the actual configuration of the selected device.